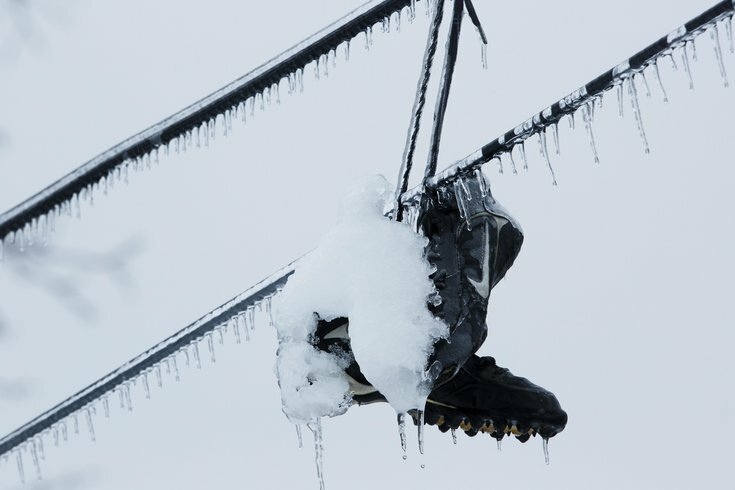 Ice and snow covers sneakers hanging from utility lines after a winter storm in Philadelphia. As House Stark would say, "Winter is coming." A team of European researchers announced last week at the National Astronomy Meeting in Wales that Earth will likely experience a "mini ice age" in 15 years, the result of an anticipated 60 percent drop in solar activity from 2030 to 2040. According to Science Alert, the bleak forecast is based on a scientific model that predicts solar cycles more accurately than ever before by looking at the sun’s "11-year heartbeat," or activity fluctuation cycle of about 10 and 12 years. Valentina Zharkova, a mathematics professor at Northumbria University in the United Kingdom who presented the findings, added that the model shows a 97 percent accuracy. In other words, get your winter coat ready. The researchers equated the mini ice age to the "Maunder Minimum," which hit Earth 300 years ago and caused the entire River Thames in England to freeze over. The good news is this is something we can survive and adapt to, unlike a full-fledged catastrophic ice age. Read the full Science Alert article here.